One of the most spectacular natural phenomenon of light in the dark sky is known as Northern lights. This happens as a result of the collision of the electrically charged particles which comes from the sun that enters in to the earth’s atmosphere. These lights are visible above the magnetic north poles and south poles. This display appears in many colors but most prominent are pale green and pink colors. Sometimes shades of yellow, blue, red, violet are also seen. Different colors that you see is because of different types of gaseous particles. These dancing colors of light forms different patterns from patches to scattered clouds. 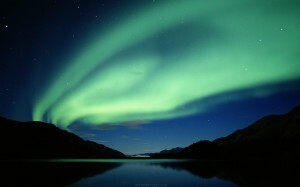 It is also called as ‘Aurora Borealis’ in the north and ‘Aurora Australis’ in south. In recent times, it is visible quite prominently and covers large distances as a result of the increase in the solar activities. According to the researches it is being believed that the intensity of northern lights increases with the increase in the solar flare. It can be seen in northern and southern hemisphere near the magnetic poles. The best places in Northern hemisphere are in northwestern parts of Canada, especially in Yukon, Nunavut, Northwest Territories and Alaska in United States. This Auroral display can also be seen from the southern tip of Greenland and Iceland, north Siberia and northern coast of Norway. The Southern aurora (Aurora Australis) is not often seen as it is mainly concentrated in a ring around Antarctica and the southern Indian Ocean. Basically, areas where is less light pollution is best places to see Northern Lights. According to the researchers, the activity reaches to its peak every 11 years and this year 2013 is peak year to watch the auroral display over the places mentioned above. Winter of the north is particularly good time to watch lights as it gets longer period of darkness. Best time is local midnight time on a clear night sky.